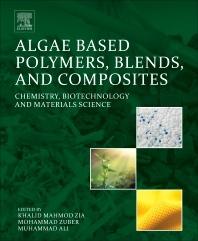 Algae Based Polymers, Blends, and Composites: Chemistry, Biotechnology and Material Sciences offers considerable detail on the origin of algae, extraction of useful metabolites and major compounds from algal bio-mass, and the production and future prospects of sustainable polymers derived from algae, blends of algae, and algae based composites. Characterization methods and processing techniques for algae-based polymers and composites are discussed in detail, enabling researchers to apply the latest techniques to their own work. The conversion of bio-mass into high value chemicals, energy, and materials has ample financial and ecological importance, particularly in the era of declining petroleum reserves and global warming. Algae are an important source of biomass since they flourish rapidly and can be cultivated almost everywhere. At present the majority of naturally produced algal biomass is an unused resource and normally is left to decompose. Similarly, the use of this enormous underexploited biomass is mainly limited to food consumption and as bio-fertilizer. However, there is an opportunity here for materials scientists to explore its potential as a feedstock for the production of sustainable materials.